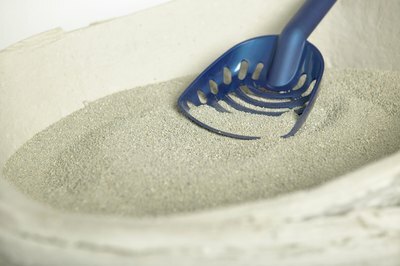 Sodium bentonite is the ingredient of concern in clumping litter. It would seem the only connection between kitty litter and irritable bowel syndrome would be what Puss deposits in the litter box. An article in the mid-1990s triggered an avalanche of discussion over the potential dangers of clumping kitty litter, but currently no scientific evidence confirms clumping litter promotes IBS. After years of relying on traditional litter, cat enthusiasts embraced clumping litter in the late 1980s. Clumping litter changed the way litter boxes were maintained. Old-style clay litter was shoveled out of the pan to get as much pee and poo left behind by Puss after she did her business. Clumping litter made the job easier and cleaner because urine formed into a solid mass, easily scooped out with the other solids. All was well until 1995, when the now defunct magazine "Tiger Tribe" published an article questioning the safety of clumping litter, particularly for kittens. The author of the article, a breeder, experienced the death of three litters of kittens who suffered vomiting, diarrhea, and nasal and eye discharge soon after they began using the litter box. Since publication of the article, cat owners around the world have taken to the Internet to ask about, and warn of, potential dangers of clumping clay litter and the potential link to irritable bowel syndrome and other ailments. Irritable bowel syndrome, or IBS, is not linked with gastrointestinal disease; it's usually associated with chronic inflammation of the cat's bowels. It can be difficult to pinpoint the cause, but allergies, diet intolerance and the inability to pass food through the gastrointestinal tract are suspected causes. Symptoms include chronic diarrhea, passage of small amounts of poop and mucus, constipation, nausea, abdominal pain, bloating and vomiting. If you've watched Puss groom, you know cats practice good hygiene; their paws are instrumental in the grooming process. Anything that ends up on your cat's paw most likely will end up in her mouth and eventually her belly. You've probably had to sweep up litter Puss has sprinkled in a path from her toilet, so you know litter clings to her paws. It's easy to see how she can easily ingest stray bits of litter from her paws as she grooms herself, a common concern with clumping litter. It's understandable to question whether ingesting litter could affect her digestive tract. Sodium bentonite is a natural substance traditionally used as a sealant, also widely used as a clumping agent in kitty litter. While it doesn't contain anything toxic, it's potentially troublesome because it swells up to 18 times its dry size when it gets wet. When Puss grooms herself and ingests stray grains of litter, the litter may swell inside her; it can cause problems if she ingests enough. There's nothing beyond anecdotal evidence linking sodium bentonite in clumping litter to IBS, and according to the ASPCA, small amounts of such litter should pass through a cat's digestive tract without issue. The ASPCA notes it may be beneficial to delay introducing kittens to clumping litter until they're 3 or 4 months old. Little kittens aren't steady on their feet and sometimes take a fall into the box, ending up with a mouthful of litter. Some kittens enjoy playing in their litter box, even eating the stuff. Waiting til Puss is a bit more mature helps ensure she won't ingest large amounts of litter that may upset her belly from any silica or sodium bentonite in the litter. If you're concerned about Puss potentially ingesting sodium bentonite or you don't want to wait to transition your kitten to clumping litter, there are options beyond clay-based clumping litter. Corn and wheat are two natural, biodegradable alternatives that clump for easy cleaning. As well, if Puss ends up eating a few of the grains, they'll pass through her digestive system with no problem. Dr. Weil: Is Kitty Litter Dangerous? Texas Sodium Bentonite Inc.: What Is Sodium Bentonite? The New Natural Cat: a Complete Guide for Finicky Owners; Anita Frazier et al. The Lighthouse: Clumping Clay Kitty Litters: a Deadly Convenience? Does Clumping Cat Litter Cause UTIs? Does the Potty Patch Work for Cats? How Does Swheat Scoop Cat Litter Work? What Are the Benefits of Clumping Cat Litter? What Causes Clumping Cat Litter to Clump?